As Zane Gonzalez sat by himself on the Cleveland Browns' bench, head down, drenched in the disappointment of a Week 2 performance that would cost him his job, New Orleans Saints kicker Will Lutz walked over and tried to offer some support. Lutz may have been the only person in the Superdome who could truly empathize with what Gonzalez was feeling. Only a fellow kicker knows how vulnerable the position is and understands the heartless truth of: You're only as good as your next kick. 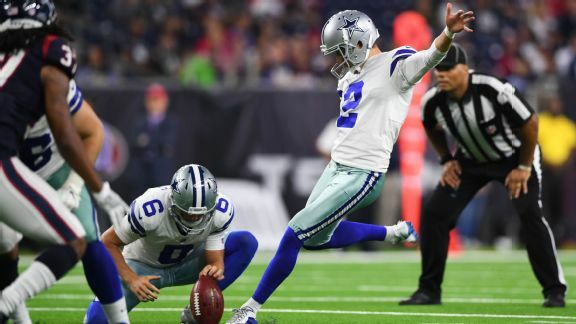 Ask Dan Bailey, the second-most accurate kicker in NFL history who struggled in the second half of last season and suddenly became too expensive for the Dallas Cowboys to keep on the roster this year. Now Bailey is in Minnesota after rookie Daniel Carlson missed three field goals and was released after the Vikings tied with the Green Bay Packers. Vikings coach Mike Zimmer called the decision to release Carlson "pretty easy." He added "Did you watch the game?" Packers kicker Mason Crosby has watched many games and has seen many misses, including 12 of his own in 2012 as he converted just 21 of 33 attempts. Yet the Packers stuck with him. "Well, I mean that's just different places' philosophy," Crosby said. "Bummer how it played out in those situations for those guys." There were 19 misses Sunday, and two kickers were released. Since Week 1 of 2017, 14 teams currently have a different kicker. NFL Nation talked to kickers around the league this week to find out how they overcame their low points and what advice they would give to struggling peers. Low point: "My rookie year, there were a lot of bumps there [28-of-34 on field goals, 49-of-50 on extra points]. And I talked to [former veteran safety] Roman Harper a lot. And it was Carolina, Roman came up to me, he saw that obviously it wasn't a good Monday for me. And he came up to me and he said, 'Sometimes you gotta take your bogey and move on.' Just like when you golf, you take your bogey, you don't dwell on it, you pick it up and you go to the next hole. You can't let it affect your next hole. I think that's one of the best things I've ever heard. And I remind him every time I see him. And I actually saw him after the game Sunday, and I told him, 'Man. After that miss that I had, it was like, I really gotta take this bogey and move on.' So that's kind of my way of getting through it. You take it to the next kick." What advice did did you give to Gonzalez? "There was nothing I could say to him in that moment. I just told him to keep his head up, don't let the media get to him. Because he was about to get hit pretty hard, obviously. I hated to watch it, and it kind of hits home obviously because that's my position. That's tough to watch." What was it like watching all the misses, including some that opened the door for you to sign with Minnesota? "It was tough to watch. I wish I was out there. In the same breath, I know what those guys are going through. I've had games like that before. It's tough. It's hard to fix that in the moment when you're young and haven't seen a lot of ball. On one hand, I was looking at it as an opportunity, but I never wish bad on anybody at our position. Your heart just goes out to guys like that when they have a day like that because it's tough." What advice would you give Carlson? "Just keep after it. I've never met the guy. I remember watching a little bit of his tape when he was in college [at Auburn], and he looks like he hit the ball really well. From talking to people around here, it sounded like he was a class act. He's got a lot of things in the right column for him as far as things looking favorable for him moving forward. I would just tell him to keep your head up and there's going to be another opportunity for sure." How did you overcome the low points in your career? "Well, I think it's a combination of things. I think for me it's always been my support system, who you're surrounding yourself with. I've been fortunate to have great teammates, great friends, great family. You got to lean on those people and then lean on veteran guys in the locker room, guys that have been doing it for a long time. Ask them what they've been through, how they've handled situations and just kind of be a sponge and soak it all, not get too hard on yourself, don't get too low and just try to balance it out and know that you're capable of performing at a high level. Try to be as positive as you can, moving forward." How much better are you because of your struggles in 2012? "I can only speak from my experience and knowing what I went through in 2012. I just know, without that year, I'm not sure I would've learned as much as I have in this job and having so much perspective and being able to draw on those experiences. Whenever it doesn't go just quite right, it's just about resetting and going right back into what works well. For me, getting past that and for those guys if they get another shot, hopefully they learn from it. It's not like you have to try to do things different, you've just got to try to learn from those experiences." So looking back, how did you get over those struggles of 2012? "Honestly some of it's just letting go of the result being the main focus. This league can be such a result-, performance-driven league. That all comes from what you do in practice leading up to every situation, so my mindset just became diving into that. And it was from the physical, mental and every side of it and also relational -- being a teammate, being a guy that other guys look at as consistent and being a guy they can count on and always approaching every day that way. That's how I'm doing it." How do you maintain confidence? "One thing that kind of helped me early in my career was in college [at Temple], as a biology, pre-med major, I had a lot of psychology classes so that helped with some things. But I've always been confident in myself and I knew the preparation in practice was going to help and carry me over into games. And my rookie year here I struggled a little bit, but one thing I've always held near and dear to my heart is I've never missed two kicks in a row. After a miss, I've always been able to let that go and get to the next kick. It's not easy, but one thing I know is, ... you're talented enough to get to this point. And there are a lot of kickers unsigned, not in the league, who are as good at the physical side of it, but they don't have the mental makeup to get through this whole thing. There are others who can do it physically, but the mental aspects of it, to get through a miss, because everybody is going to miss, it's how you're going to get over it." Advice on being ready for a key moment in a game: "I stay focused by myself,. I kick a lot into the net before those end-of-game moments. I'll look at where we are on the field. What down is it? How much time is left? You don't want to be surprised or unsettled when it's time to go in, so know the situation. I also keep to my fundamentals in the net, just make sure I go into the game after hitting the ball well into the net, striking it well, feeling good. The other thing, and it's a little superstitious of me, maybe, but I always get a drink of water before I go because I don't want to be out there if they call a timeout or something and then my mouth gets dry. Just get comfortable, as comfortable as possible and go make the kick." Hardest moment: "I had some in college [at Florida State] that I had to work through. That has helped me when I came in the league as well. The one in college was we were playing a homecoming game at Florida State [in 2011]. We were playing North Carolina and I missed a game-winner. So it's working through that, and in school you're going to class and whether someone knows you or doesn't know you. In your head, they know and they know you missed it. So you're walking on campus and you have to remind yourself of the hours you put in, the film, the mental preparation. Nothing has changed; it's just one kick. I still have been uniquely gifted and I worked in a matter to set me up for success. You have to tell yourself that because everything in you is telling you the opposite. "It's a long week. Some weeks seem short and others seem long. That was a very long week. I remember praying for another opportunity and hoping one would come up. It's a lot more prevalent in the pros where game-winners happen. In college a lot of games are lopsided. I was fortunate enough I got another opportunity the very next week [vs. Clemson]. I was able to hit that and I don't want to say gain my confidence because it wasn't lost, but you allow yourself to move on. You feel better. Part of it is allowing yourself to process the moment, not pretending like it didn't happen and processing what went wrong and what can I do better and moving on after letting yourself feel that for a day. Once that passes, just working and not getting away from the routine that got you to where you are." What was the roughest patch of your career? "I think the hardest part was me coming in for a week or two, knowing that I wasn't going to be the guy for the rest of the season. I would come in for a guy, and to me that was my one opportunity on prime-time TV to show I still had the ability to play. And you're doing it with guys you've never played with. You're kind of trying to earn your keep again. I played for a week with the Giants, going into it, I knew I probably wasn't the guy. Then I went into it with the Steelers and then I came here for four weeks. It's a crazy business and you just try to earn your keep and make the most of every opportunity you have." Where's your confidence level right now? "I feel good. More than anything, I feel like I've kicked at a high level. In this business, you've got to continue to do that. You can see, it's kind of week-to-week for specialists, and I've experienced rough days at the office, too. You hate seeing that for guys like Zane Gonzalez, the rookie Daniel Carlson in Minnesota. You just hope those guys are going to be able to handle it mentally if they're given another opportunity. It's kind of out of their hands. They'll get to sit on it for a couple of days and see what happens." Thirteen teams have a different kicker now than they did in Week 1 of 2017 for non-injury related reasons, according to ESPN Stats & Info. * The Rams also have a different kicker, but it was injury-related. Do you have a moment you remember as the lowest of your career? "Not really. I think there were some things I did coming out of Chicago technically that I wasn't doing great. I got cut there after an 87 percent field goal season and then I had a preseason where we had a bunch of change and not a lot of consistency and I let myself kind of get away from the things that I would do really well technically. So, when I got cut it was nice to kind of have that time to be able to focus on those situations where my footwork was sloppy or my timing was not as good as it had been when I was younger kicker." So what would your advice be to kickers low on confidence? "It happens. We've all done it. I missed a game-winner from 37 yards on the left hash against San Francisco about five years ago. It still upsets me to this day. Everyone goes through it, it's just about how you rebound, you know? And how long you let it linger for. You're only as good as your next kick. So, I think I had a moment where I missed three in a row in Chicago and from that kind of point on, I just went back and did some self-scout and I've tried to stay true to the things that I know that I do tempo-wise or swing-wise that have been able to let me have some success in the NFL." Your lowest point, getting cut with Chargers, how did you manage through that? "Yeah, probably getting cut when I didn't feel like I deserved to get cut. That organization told me some things that they didn't live up to, which is a huge eye-opener that people in this business don't always tell the truth." Read more about Lambo's impressive streak and his parting with the Chargers. What's the low point of your career? "I try not to think about it. If you're still thinking about the bad things that happened, you don't want that in your head." Advice for struggling kickers? "As a kicker, the positive mindset is so important, not getting down on yourself. Thinking positive thoughts is going to help you. It's going to happen to all of us. Look at Adam Vinatieri. He's a Hall of Fame kicker. He's going to be one and he's had some low points in his career." Ryan Clark and Matt Hasselbeck argue over whether kickers are causing all the ties in the NFL. Thinking back on your career, what was the lowest moment you can remember and how did you cope with it? "It was my last year on Kansas City. We were playing the Chargers, it was 2013, I believe. I missed a kick at the end of the game to beat them. For us, our playoff spot wasn't going to change, we were the No. 5 seed either way. But still, it was a bad feeling to let the team down. The biggest thing for me was to just get back to work and focus on the things that I could control, which is my work ethic and focus." What would you tell a fellow kicker who is struggling and trying to regain his confidence? "As kickers, you're going to have ups and downs. The key is how you respond to them. Then you let the other things take care of themselves. Your effort and your attitude. Those are things that you can control. You aren't going to make every single kick. Sometimes there are going to be things that you can't control, whether it's wind or whatever. Put it behind you because every kicker in this league, I don't care who you are, you're going to have a bad day. You have to be able to come back from it. For me, confidence comes from doing well in practice and trusting technique. You have to get back out there and just work. That will restore your confidence." What's the low point of your career? "I had a bad spell, was that 2015 [15-of-21 in field-goal attempts], I had made like seven in a row. But then like four of my misses before I got hurt were like off the upright. They weren't four consecutive. I had never hit an upright before in my life and I hit like three or four times." How do you overcome struggles? "For me, I try to look at it kind of like a plow horse. Sometimes soil is going to be really rocky and tough. Sometimes it's going to be really smooth. And your job is to just keep on going and do your job. So as far as getting through things, that's how I try to approach it." Brett Maher has found help with his mental approach from a sports-performance consultant. Read. What advice would you give to a struggling kicker who's lost his confidence? "I can't really speak for anyone else, but for myself, I just try to be able to repeat the same thing over and over again, and do what gives me the best chance of doing well. The hardest thing to do is not to doubt yourself when you screw up, so just kind of sticking with what you know gets you the best results. If you go out to practice and you make nine out of every 10 kicks -- and you miss one in practice -- you're not just changing everything. It's got to be the same in the game and you just have to be able to ignore all the nonsense around you, and all the negativity that comes with being in our position -- which is easier said than done. You have to not care about what everyone else thinks. It's the easiest position to point out when you mess up in sports. So you have to have enough inner confidence, and have faith in what you're doing, and that you're going to do it well and not let the outside noise distract you."